You might be forgiven for thinking that – of all things – the stars were equal above us. Too far, too big, too old, to be affected by anything that puny man could do. The stars look down upon us with benevolence or with despite, according to the mood of the poet, and our language is rich in reminders of how mankind has thought its destiny written in the stars. Star-crossed lovers look for lode-stars, and it sometimes seems that every writer stuck for a word has merely to look up to find his all-purpose answer in the stars. Shakespeare once called them the bad revolting stars. Traditionally, the stars affect us and we can do nothing in return. Yet now it seems that mankind’s infinite capacity for messing things up has reached even to the stars. 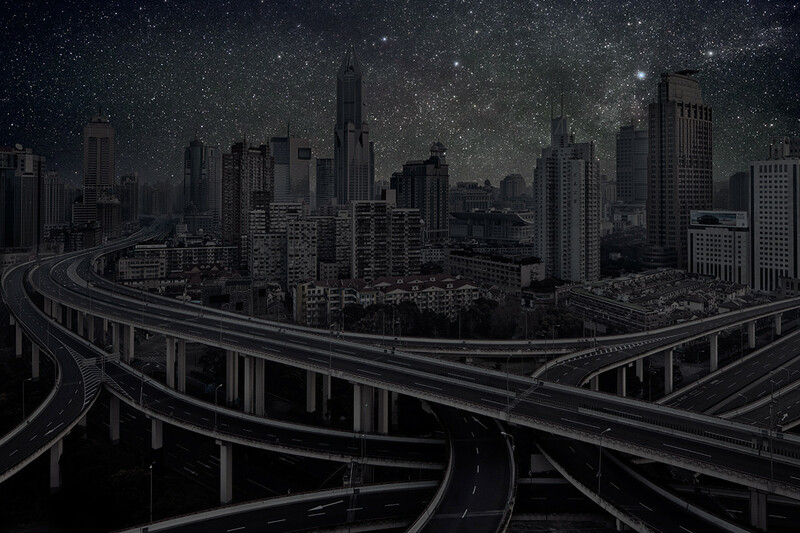 In Thierry Cohen’s series, Darkened Cities, we think we see bright night skies over cities. Very traditional, very poetical. Actually, what we’re seeing is the opposite. These skies are an indictment and a lament. These are the skies that we don’t see. They are also extremely clever photography, in which highly skilled execution provides rich layers of meaning. The principal operation that has to take place before these pictures can exist is that the sky from one place has to be superimposed upon cityscape from another. The reason is simplicity itself. 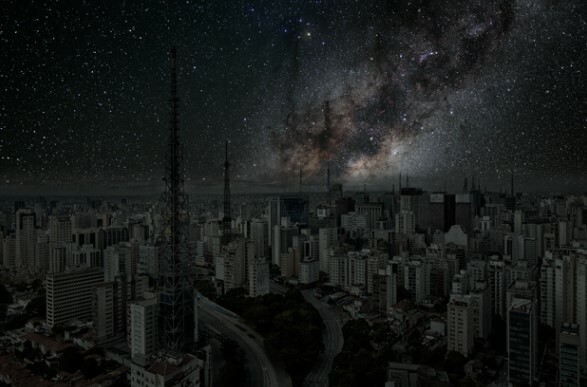 As every amateur astronomer knows, it is impossible to see this detail in the night sky above a city. 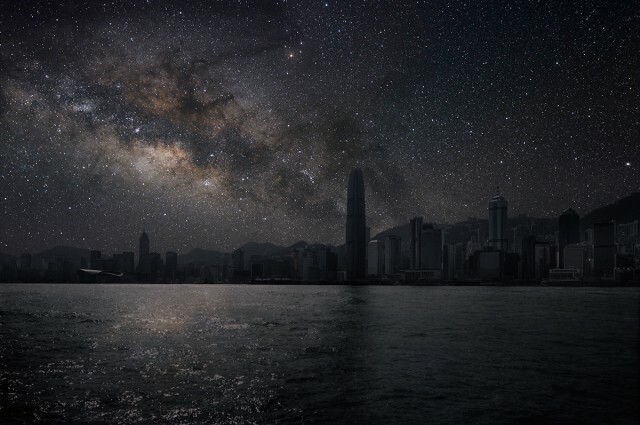 Modern lighting provides a level of light pollution so high that looking into the urban sky is like looking past bright headlights while driving. Add to that the atmospheric pollution above any city, and you have a screen only barely penetrable by light. 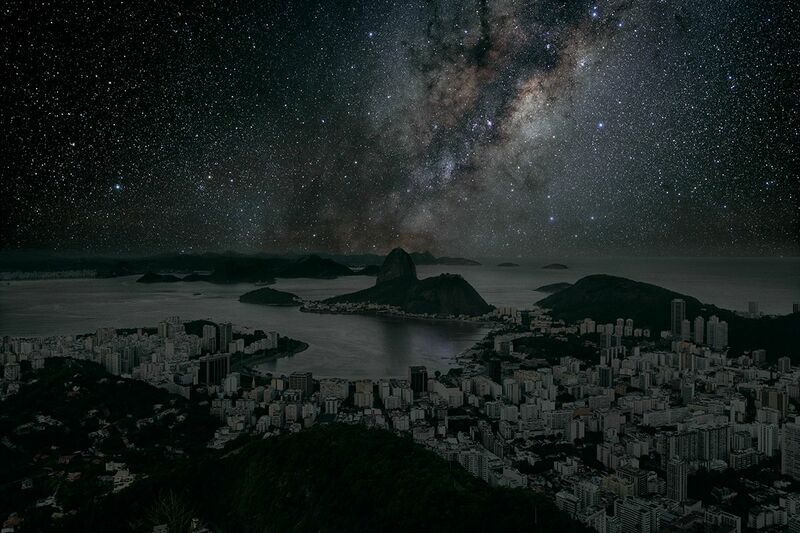 Stand in New York or Rio and look up, even on the most cloudless night, and you won’t see Cohen’s explosions of light. Yet it is there, blotted out only by man’s interference. The first photographer to split his photographs horizontally in two, specifically to even out the luminous balance, was the nineteenth century French master Gustave Le Gray. Le Gray, a fine technician at the very point of technology, found that the emulsions available in his day could not record equally well the bright sky and the twinkling water in the great series of poetic seascapes that he made in the 1850s, so he made them from separate negatives for sea and sky. The convenient straight line of the horizon helped him both to join them and to conceal the join from his viewers. Cohen is also a fine technician, who has practised digital photography for longer than almost anyone else. But he is not practising for virtuosity alone. Cohen does not merely replace one sky with another for convenient photographic legibility. By travelling to places free from light pollution but situated on precisely the same latitude as his cities (and by pointing his camera at the same angle in each case), he obtains skies which, as the world rotates about its axis, are the very ones visible above the cities a few hours earlier or later. He shows, in other words, not a fantasy sky as it might be dreamt, but a real one as it should be seen. This is a very powerful treatment. It is laborious in the extreme. To find places with the right degree of atmospheric clarity, Cohen has to go – always on the latitudes of our cities – into the wild places of the earth, the Atacama, the Mojave, the northern wastes of Mongolia. Who among us beyond a handful of professional astronomers would know if Cohen cut the odd corner by finding a good sky not quite so remote? But photography has always had a very tight relationship to reality. A good sky is not the right sky. And the right sky in each case has a huge emotional effect. 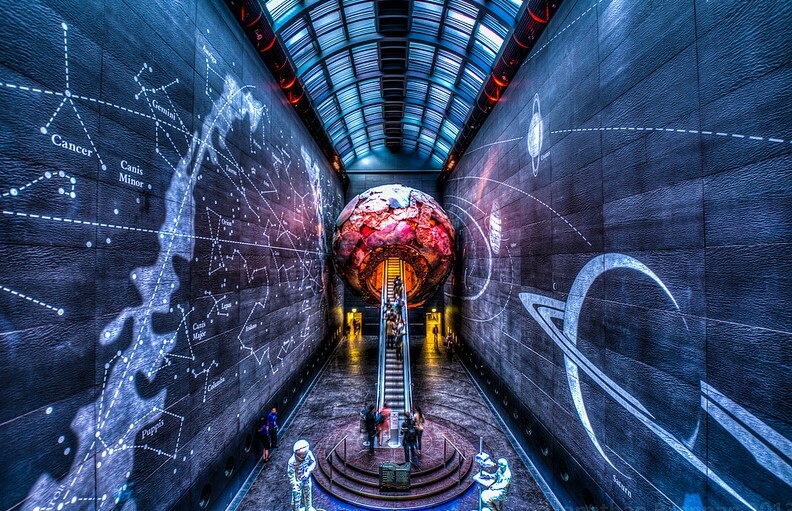 As more and more of the world’s population becomes urban, and as we lose our connection with the natural world, so it becomes plain what damage is caused. 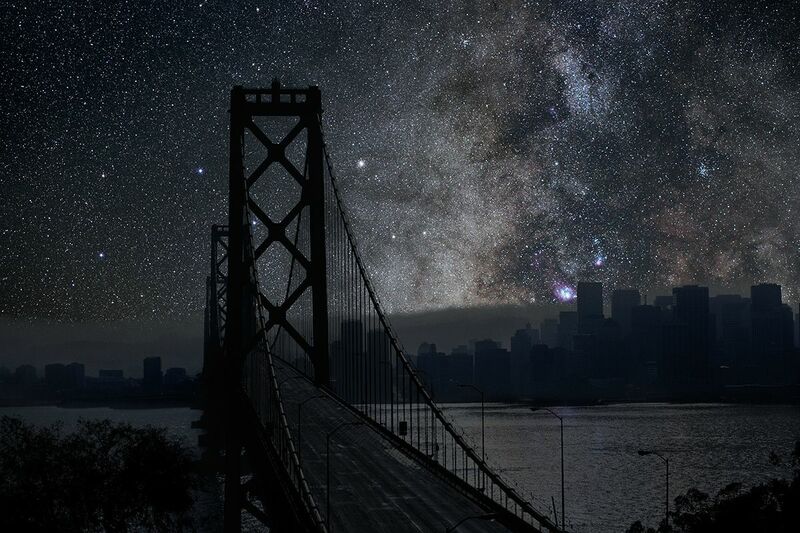 Are there injurious effects of light pollution? Quite possibly. To people there may be physical connections to certain cancers, and there are surely psychological burdens of permanent day. To other natural life, flora and fauna, the damages are wide-reaching. The ‘city that never sleeps’ is made up of millions of individuals breaking natural cycles of work and repose. Lose sight of the sky, and you become a rat in a lab. We’re all heading that way. It may come to it that we can never properly see the sky again. Already there are produced maps of the intensity of pollution by light which are so bright they’re scary. There are still gaps where you might see the sky, but they’re not where we all live. Cohen hasn’t simply shown us the skies that we’re missing, by the way. His process is many degrees more complex than that. Notice how dead his cities look, under the fireworks display above? No lights in the windows, no tracers of traffic? Barely even reflections of the blazing starry glory above. That’s because they are in fact photographed in the daylight hours, when lights are switched off or shine out less brightly. How clever this is, each photographic obstacle to Cohen’s expression isolated, and solved to perfection. There is an urban mythology which is already old, in which the city teems with energy and illumines everything around it. All roads lead to Rome, we were told. Cohen is telling us the opposite. It is impossible not to read these pictures the way the artist wants them read: cold, cold cities below, cut off from the seemingly infinite energies above. It’s a powerful reversal, and one very much in tune with a wave of environmental thinking of the moment. Look at the work of Sebastiao Salgado, for example, who used to show specific areas of distress (geographical or social) until his subjects grew bigger until now (in the series entitled Genesis) he is working to tell us about the health of the planet itself. Thierry Cohen didn’t merely find pictures that pointed so sharply to the blight that our mega cities have become, he couldn’t. He made them instead, with patience and skill and the driving desire to be understood. Night time is as attractive to photographers as it is to poets. One thinks in a moment of the terrestrial nights of such artists as Brassaï, for whom the night was a stage of its own. René Burri, the great Swiss photographer, rushed out into the New York blackout of 5th November, 1965 with only 8 rolls of film and made 40 of the greatest pictures of a city at night that you will ever see. Weegee loved the night, of course, and Nan Goldin, and Bill Brandt and dozens of other photographers of the city. It’s particularly a city thing, you see. In the country, when it gets dark, you go to bed. It’s in the cities that we go mad a little at night. Cohen’s fine series shows that he understands this. Zoom in on one any of these pictures, I feel, and you’ll find oily dark scenes from Weegee in every window. Otranto Cathedral or the Cathedral of Santa Maria Annunziata (Saint Mary of the Annunciation) is the most important Christian church in the Italian city of Otranto and is the seat of the Archdiocese of Otranto. It was consecrated in 1088. The mosaic running the whole length of the nave, sanctuary and apse is 12th century in date – it was commissioned by the first Latin archbishop of the city, Gionata, and created between 1163 and 1165 by a group of artists led by Pantaleone, a Basilian monk from the monastery of San Nicola di Casole. It shows scenes from the Old Testament and chivalric cycles, as well as figures from medieval bestiaries, arranged alongside a ‘tree of life’, showing human experience from the Fall to salvation. 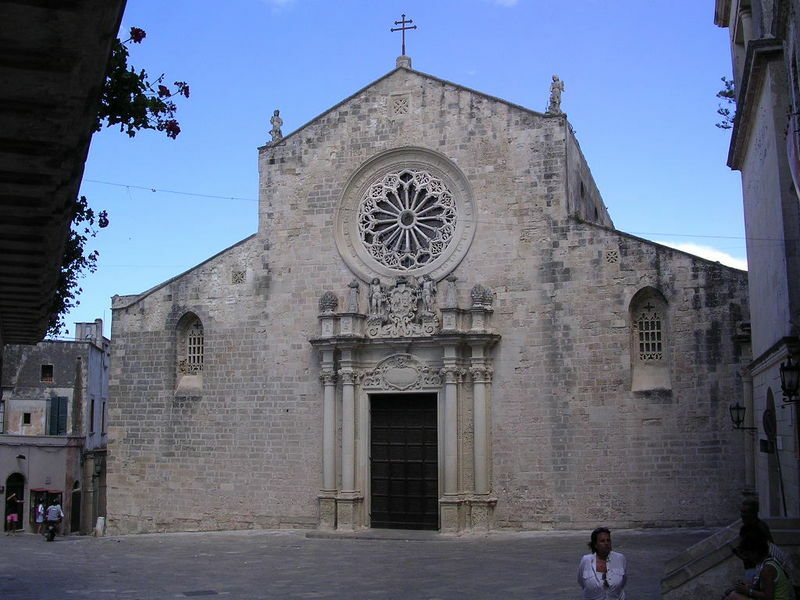 A great mistery of art and faith has been kept for eighteen centuries in Otranto. This small town, at the tip of Salento, is famous in Mediterranean history for being besieged, conquered and sacked in 1480 by the Turks who attempted to build an Ottoman bridgehead on Christian Land. The last 800 men who withstood the attack were decapitated. The Otranto’s Martyrs’ skulls are stored in glass shrines by a side altar of the cathedral. Muslims demolished its facade but they didn’t dare to destroy the inside, with its most precious treasure: a monumental mosaic covering the entire floor of the cathedral like a lavishly decorated carpet of colorful stones. It stretches for 16 meters, from the entrance to the altar. Crafted between 1163 and 1165, it is the largest in Europe, almost intact, resilient to the damage and wearing effect of time. Thus, under a visitor’s feet a fabulous, old time cartoon is shown. 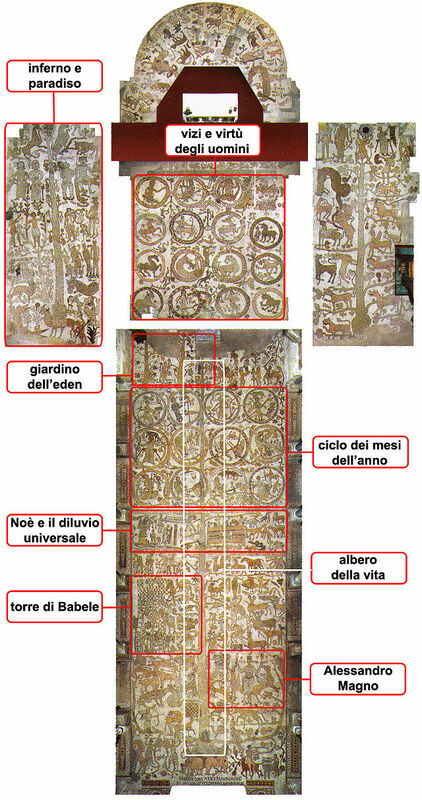 A spectacular encyclopedia that in the central nave revolves around the Tree of Life, a very long trunk with several rows of parallel branches. Two minor trunks run throughout the aisles. Among the ‘vegetable spaces’ biblical stories are depicted: Adam and Eve driven out of Eden, the building of Noah’s Ark, Cain and Abel, the Tower of Babel, Solomon and the Queen of Sheba…And hidden among them, central characters from medieval tales can be found unexpectedly: King Arthur and Alexander the Great, as well as pagan myths such as Samson, Diana and Atlas. 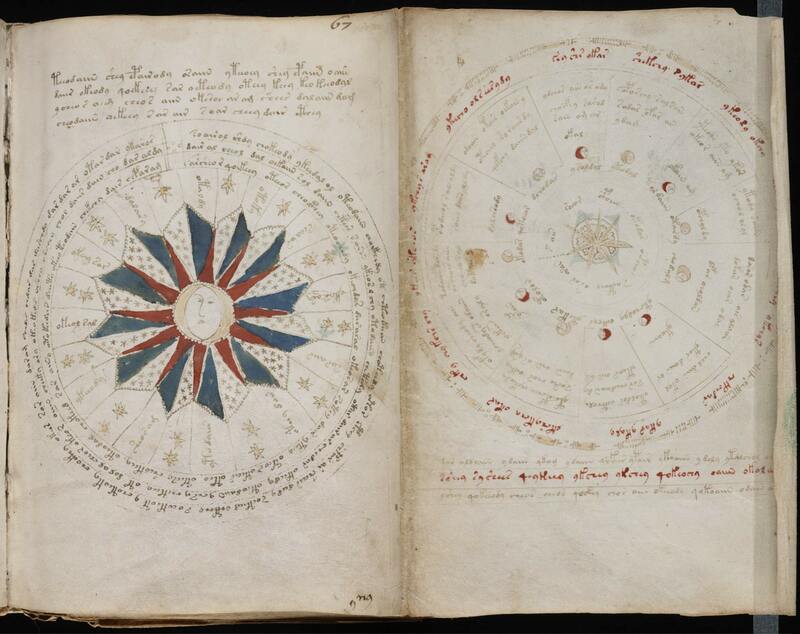 In a series of circles the twelve months of the year are depicted with their various seasonally-related working activities, in other words earthly everyday life. Elsewhere life in the Next World is evoked in Heaven and Hell. Some sixteen medallions hold the whole medieval bestiary with its ambiguous symbolism, while domestic, ferocious, exotic animals and bizarre creatures run around like in a fantasy free zoo. Along the path queries grow. Why are the Tree of Life’s roots not sunk in the ground but rested on two elephants, a male and a female? Where does the cat in boots come from? What does a bearded centaur do with a chessboard on his head? What’s the meaning of the writing PASCA next to a winged griffin? Compelling stories that risk, though, taking over the real emotion. A direct and personal experience that no 3-D Avatar style movie can beat, because it is mind and eyes engaging, it excites memories, imagination and knowledge. Like an Ipad or an Xbox emerging from the darkness of the Year One thousand. 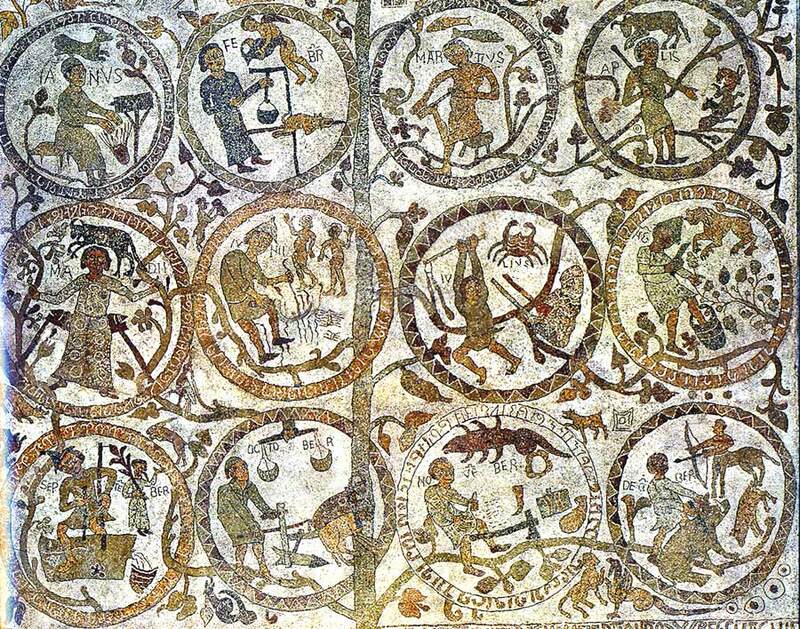 The layout of the monthly activity / Zodiac roundels, which are just to the west (underneath) of the crossing and span the entire width of the nave. January is top left, then read as you would script to December in the bottom right hand corner.